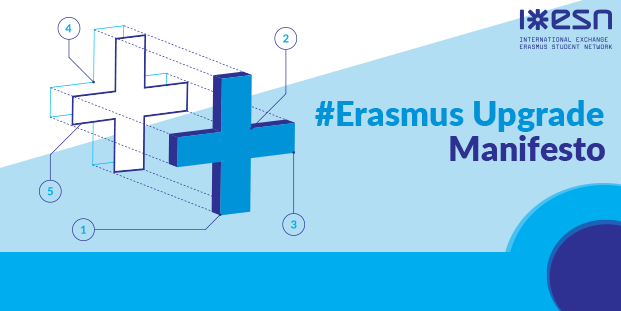 Following over 2 years of consultations, on the 27th of April the Erasmus Student Network released the #ErasmusUpgrade Manifesto which contains 13 recommendations to improve the successor of the Erasmus+ Programme. ESN wishes to see the OUTREACH of the programme increased, both in Europe and throughout the world through the use of mass media and new digital tools. We recommend implementing reinforced and inclusive SUPPORT SERVICES to face societal challenges and equip participants with the skills they need to face the challenges of the 21st century. The IMPLEMENTATION AND MANAGEMENT of the programme should be improved by standardising mobility processes and introducing digital tools to counter bureaucracy and reduce paperwork. We demand full RECOGNITION OF MOBILITY OUTCOMES through better communication, implementing mobility windows and an “integrated Erasmus+ approach” to study and work. Finally, ESN asks for an INCREASED BUDGET FOR MORE QUALITY, OUTREACH, AND TRANSPARENCY to improve the inclusion of students from disadvantaged backgrounds, national support towards mobility, and monitoring and levelling incoming and outgoing students. Check out the manifesto here or download it down below.